Chawanmushi is a traditional Japanese egg custard, made by steaming eggs whisked with dashi broth and soy in small ramekins. This is a variation on a traditional chawanmushi by David Kinch of Manresa restaurant in Los Gatos, in which the chawanmushi is flavored with a dashi infused with green garlic. If you can't find green garlic, regular dashi will work just fine. The ikura on top provide a salty "pop" that's a great textural contrast, and the avocado puree is the perfect creamy/salty note to finish. Note that traditionally caviar/roe is served with non-metallic spoons, as some claim that stainless steel will react with the roe and produce undesirable flavors. I use ceramic spoons from CB2. Prepare green garlic dashi: Saute half of the sliced green garlic in butter on medium-low heat, taking care to not brown. Season with salt. Add the dashi, bring to a simmer, cook for 5 minutes. Add the other half of the green garlic, cook another 2 minutes. Strain. Prepare the chawanmushi (this may make more than 4 portions depending on the size of ramekins you choose to use): whisk 4 eggs together in a bowl. Whisk in the green garlic dashi and season to taste with shoyu and mirin. Transfer to ramekins for serving. When ready to serve, steam the chawanmushi for 9 minutes. Remove and let cool several minutes, as they will be extremely hot. 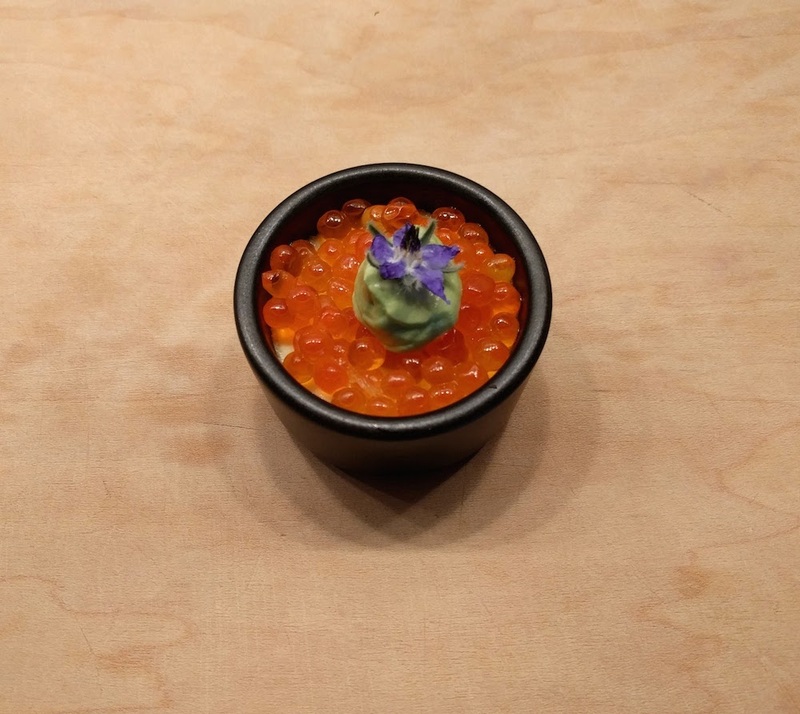 Top each chawanmushi with a spoonful (~ 1 Tbsp) of ikura, pipe on a dollop of the avocado puree, and top with a borage flower. Serve with a non-metallic spoon. Want to be emailed when new posts are published? Just recipes, nothing else.